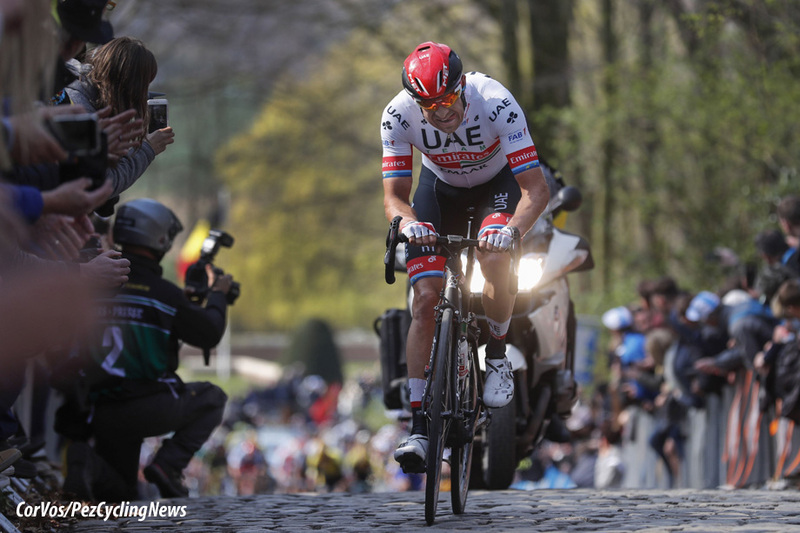 PezCycling News - What's Cool In Road Cycling : Gent-Wevelgem’19: King Kristoff! 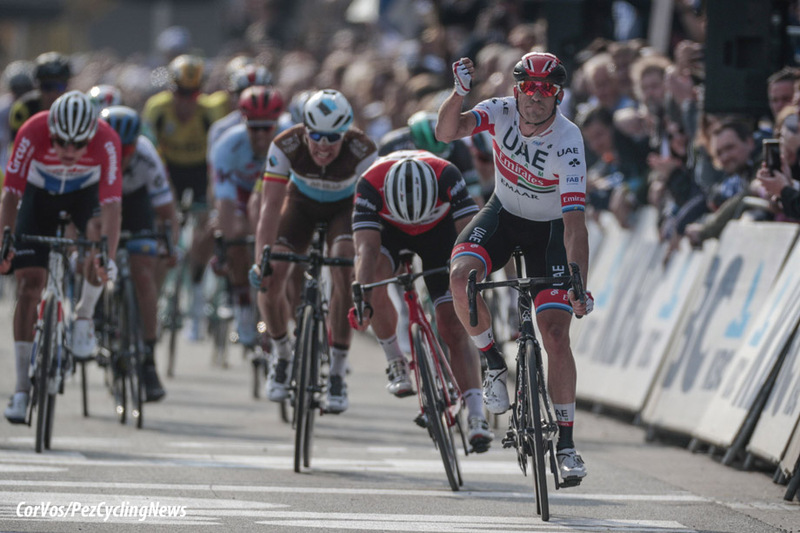 Race Report: Alexander Kristoff (UAE Team Emirates) took a wonderful Gent-Wevelgem victory after an incredibly hard day's racing. What chance a Flanders victory for the Norwegian now? 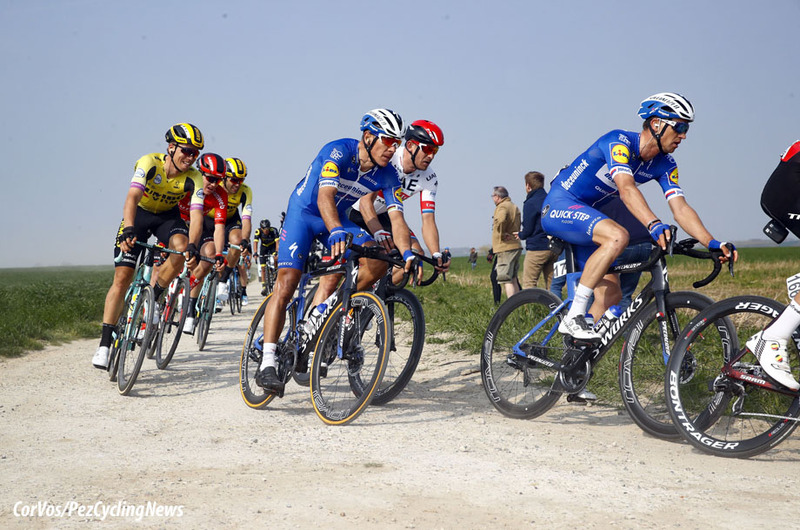 Losers of the day: Deceuninck - Quick-Step, the Belgian team worked so hard during the day, they had nothing left for the sprint. 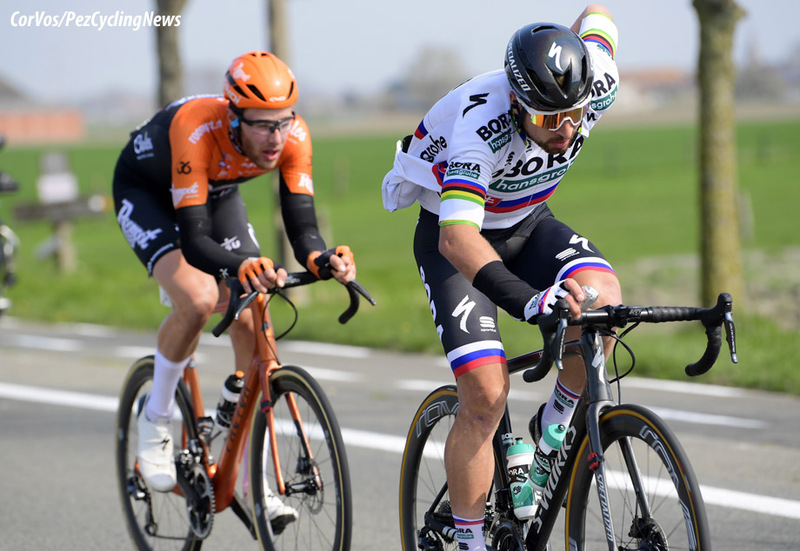 After an hour, and 51km into the racing, an elite break went clear with Peter Sagan the key member. They never had a major gap but when the race was in the difficult hilly middle sector the leaders were able to creep towards a minute lead. 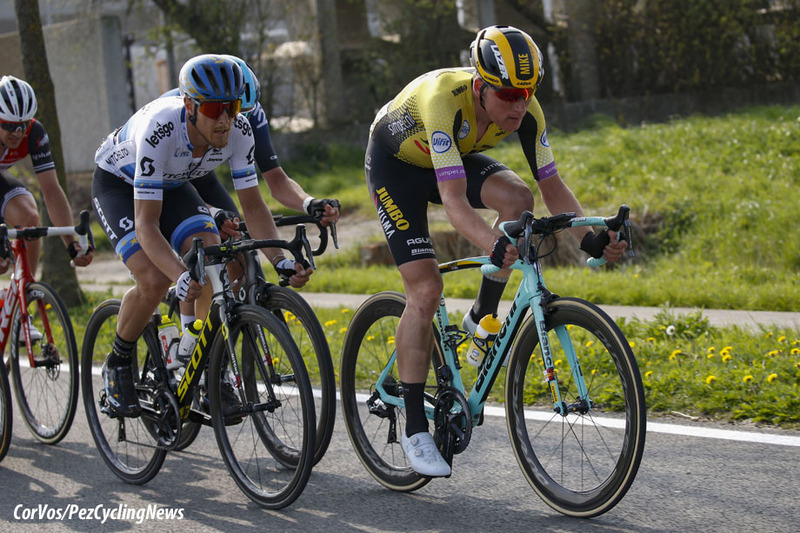 The final flat run in was always going to be the important part of the race and the five break members left over were caught with 15km to go. 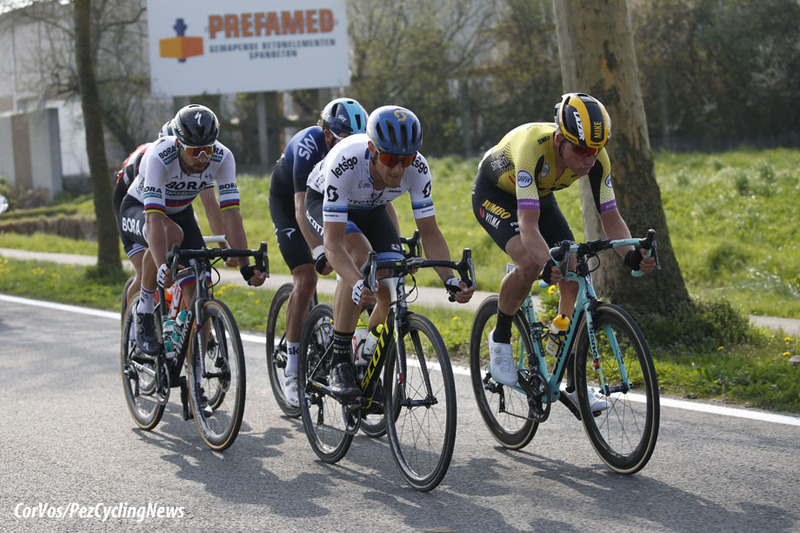 Deceunick - Quick-Step looked to be setting the race up for Elia Viviani but they only had Gilbert and Stybar left on the run in and near constant attacks took their toll. They did eventually bring the peloton into the finishing straight without a break but Viviani simply didn't have the legs and Alexandr Kristoff managed to ride the wheels and emerge a clear victor. John Degenkolb came home in second, a nice tonic for Trek-Segafredo after a rubbish start to the season. 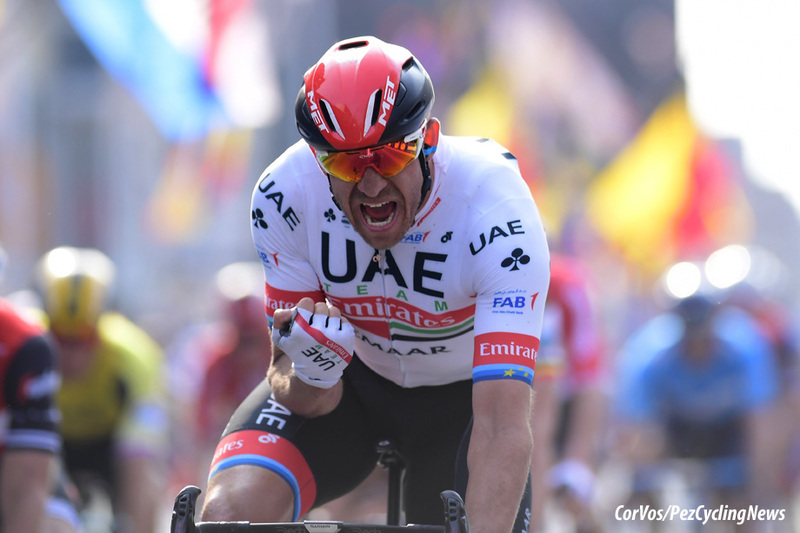 Both Kristoff and Degenkolb look good as they head into the key objectives of their seasons. 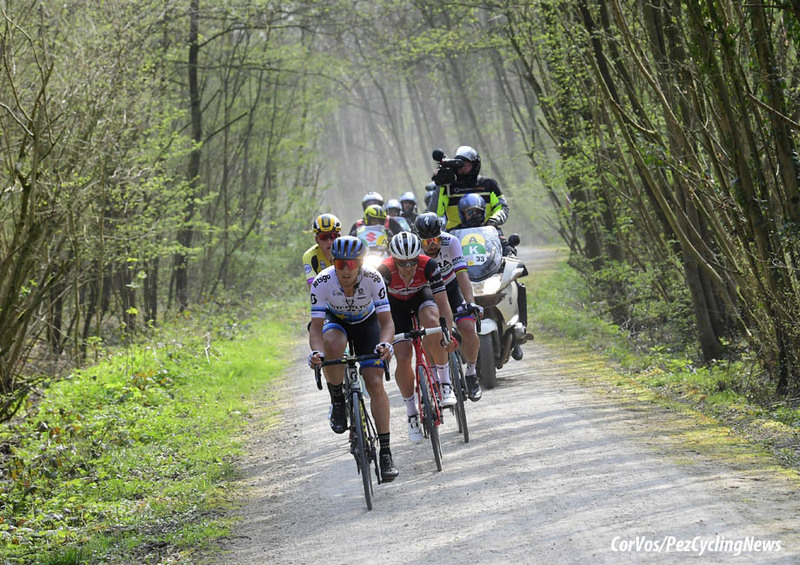 Until 2011 Gent-Wevelgem was a midweek event sandwiched between the Tour of Flanders and Paris-Roubaix. Unless the weather was particularly terrible or the wind blew, it was a race which finished with a sprint. A little sorbet to cleanse the pallet between the stunning drama of Flanders or Roubaix. It was moved to its own weekend though in 2011, extended in length, and had more climbs forced into its parcours. 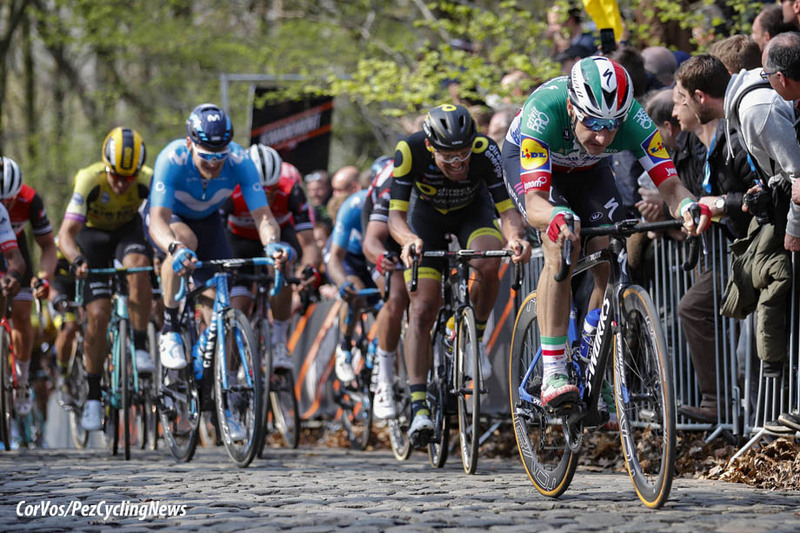 It's no surprise that since 2011 the winners have been Peter Sagan x3, Tom Boonen x2, John Degenkolb, Luca Paolini, and Greg Van Avermaet - hard men who can sprint rather than sprinters who can occasionally turn their hands to riding on cobbles. The route is pretty simple, pan flat for 130km where the route heads towards the seaside before cutting south towards the hills. The last 121km feature ten climbs and four cobbled sections although in truth these are squashed into a 90km section, the last 34kms are flat and free of cobbled roads. Despite some early breakaway attempts the field was all together after one hour of racing where 51km were covered. However under the pressure from the exceptionally fast start a split happened in the peloton and we had an exceptionally strong group clear. 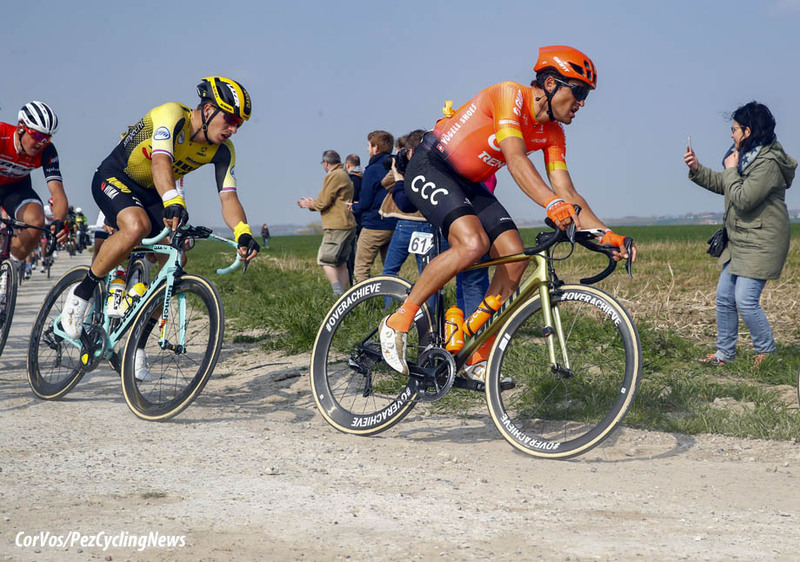 The group was 20 riders strong and featured Peter Sagan (Bora-Hansgrohe), Matteo Trentin (Mitchleton-Scott), Wout Van Aert (Jumbo-Visma), Luke Rowe (Sky), John Degenkolb (Trek-Segafredo), Fernando Gaviria (UAE-Team Emirates), Mathieu van der Poel (Corendon-Circus), and Niki Terpstra (Direct Energie). 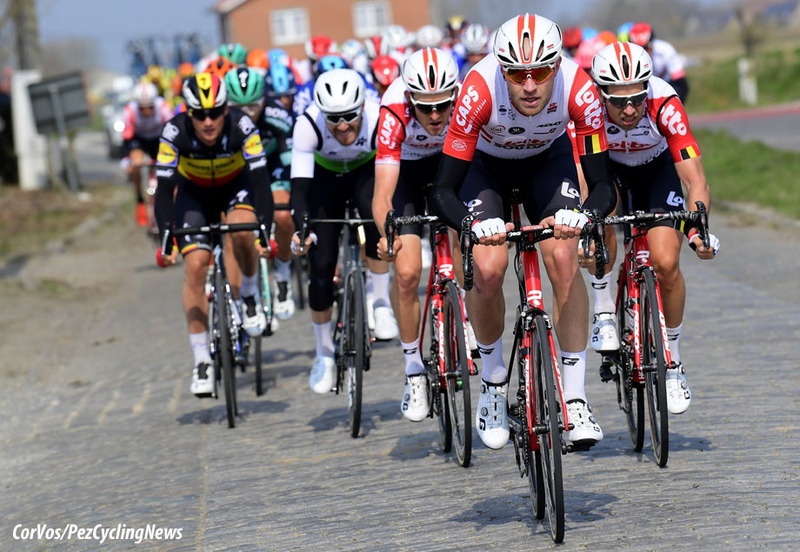 Deceunick - Quick-Step had a single rider in the break but nobody of the strength of Sagan or Degenkolb and CCC Team had entirely missed out, as had Lotto-Soudal. 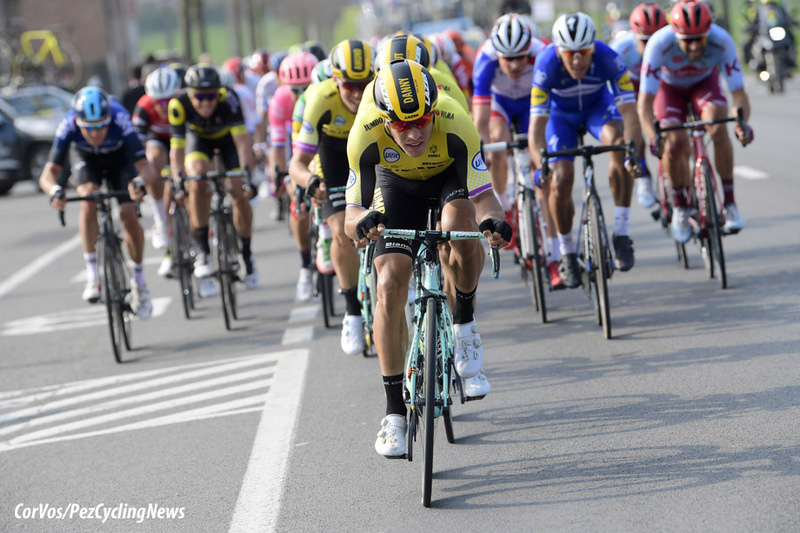 With 125km to go the Sagan group had 1.30 and all the major difficulties were yet to come. 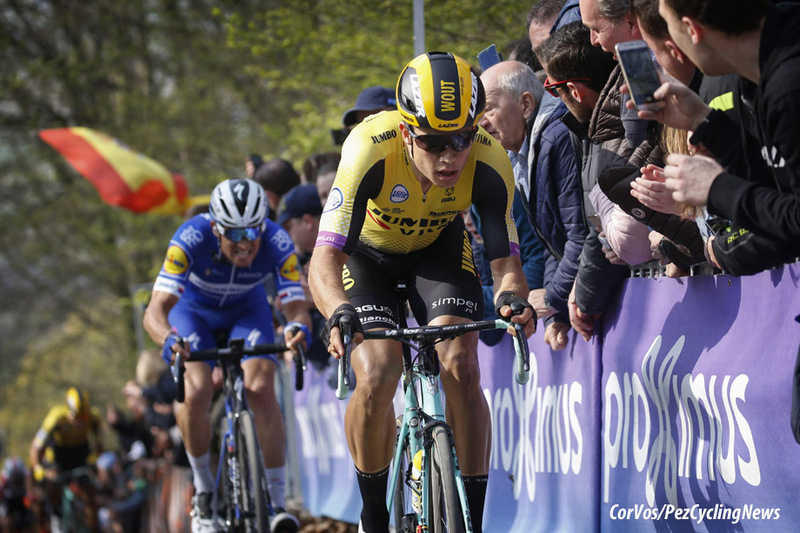 As the race entered the final 100km the racing was hard but the peloton were finally getting on top of the chase and the gap was tumbling under the minute mark. 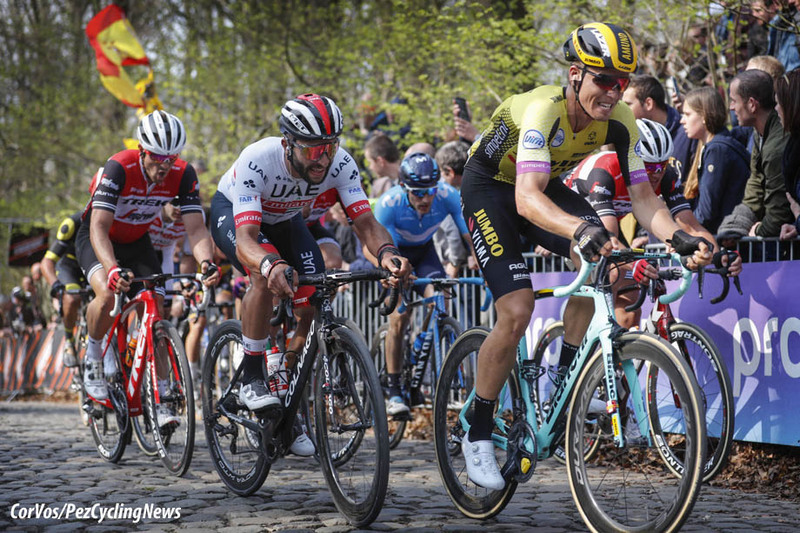 The break's participants had been eroded away as the pressure, and climbs, had increased and their lead continued to tumble. 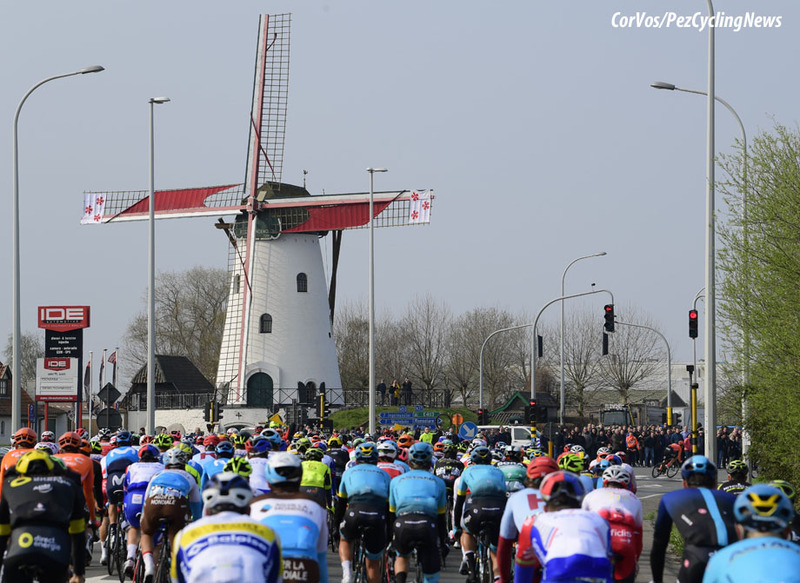 With 70km left to go the peloton were within sight of the leaders and again the pace ramped up and left just four leaders ahead of the heavily reduced peloton. 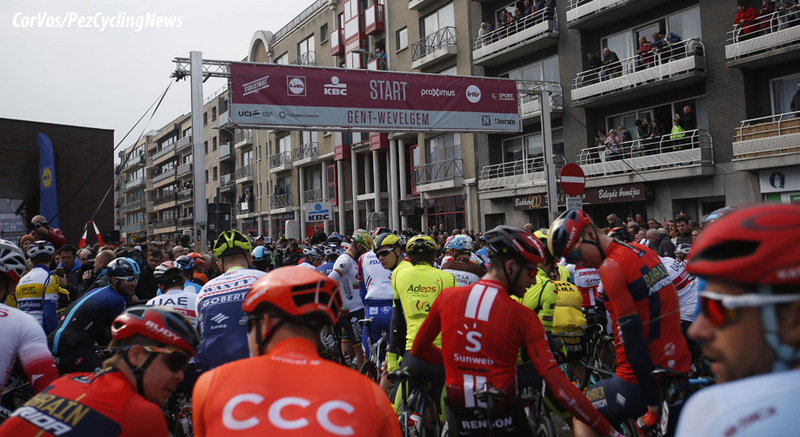 The leaders were Sagan, Trentin, Mike Teunissen (Jumbo-Visma), and Edward Theuns (Trek-Segafredo) and they had a gap of 20 seconds on the peloton. Some of the former leaders had dropped back into the peloton and some had been spat out the back after their hard work earlier in the race. Despite the even clearer numerical advantage the peloton now had the gap was only going one way and the four were now leading by 40 seconds. 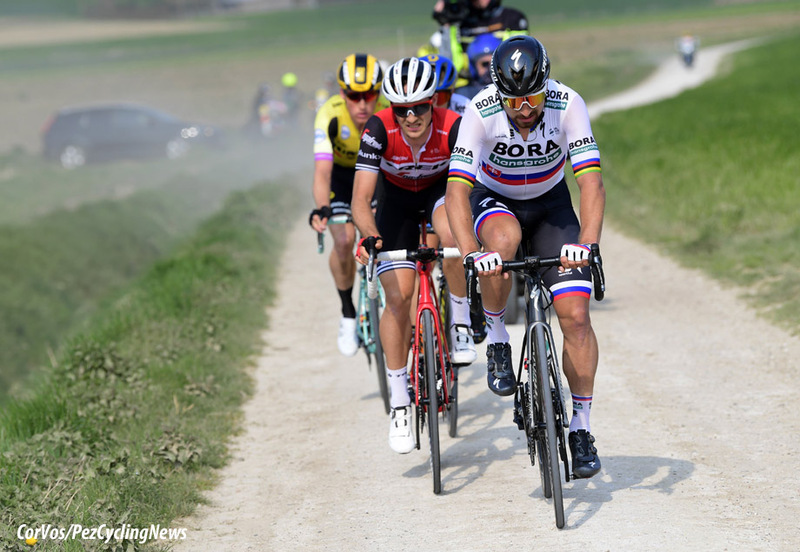 The gravel roads, or Plugstreets, allowed the four to slightly increase their lead to 47 seconds. Could they keep going though, 150km after their break began? 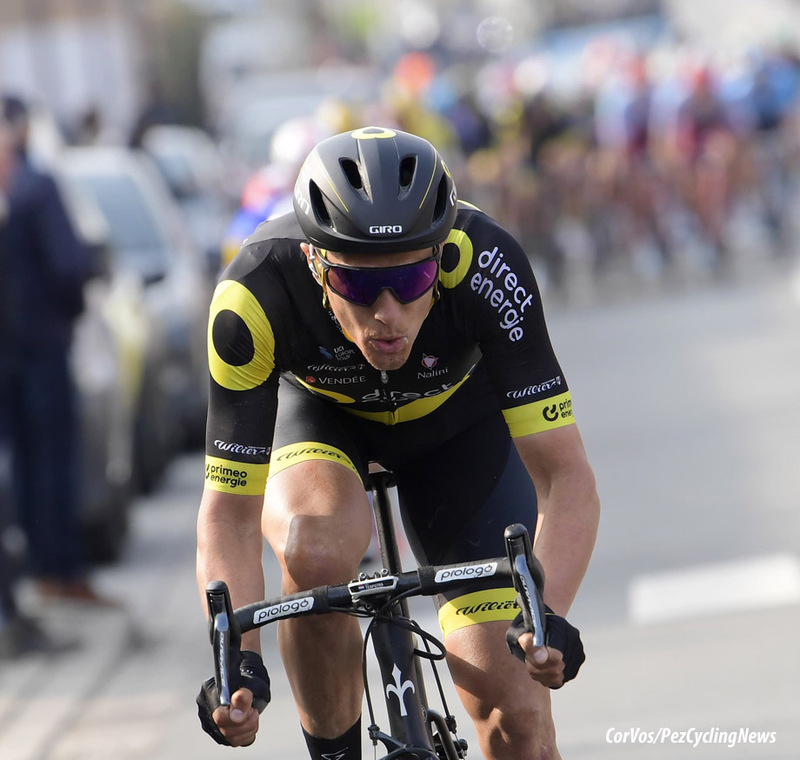 The gap was again creeping up towards a minute and Luke Rowe, who had previously been in the break and was the only Sky rider left near the front, decided to jump away to try and make it five riders at the front. 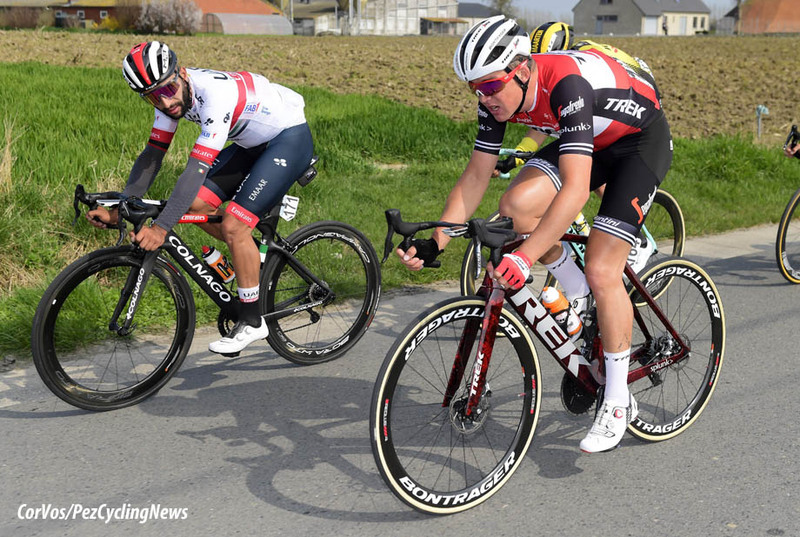 Rowe joined the four and Alexandre Kristoff (UAE-Team Emirates) was the next rider to try and join the leaders. The Baneberg was the penultimate challenge of the day, topping out at 39km from home and Kristoff was closing to within 30 seconds. The peloton were either playing the waiting game or they simply had no cards left to play, the gap had sat at 46 seconds for the best part of 10km. 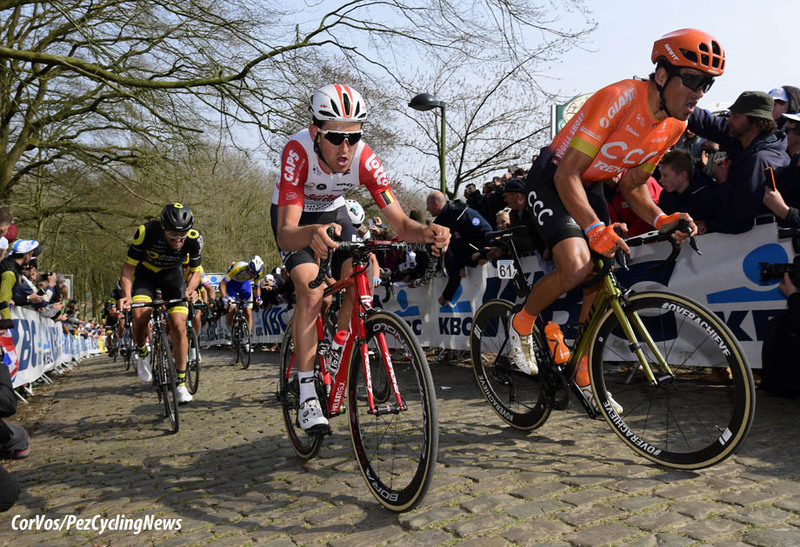 Matheiu van der Poel launched an attack at the summit of the Baneberg and he was joined by Wout van Aert who was content to sit on his wheel with Teunissen perched in the leading group. 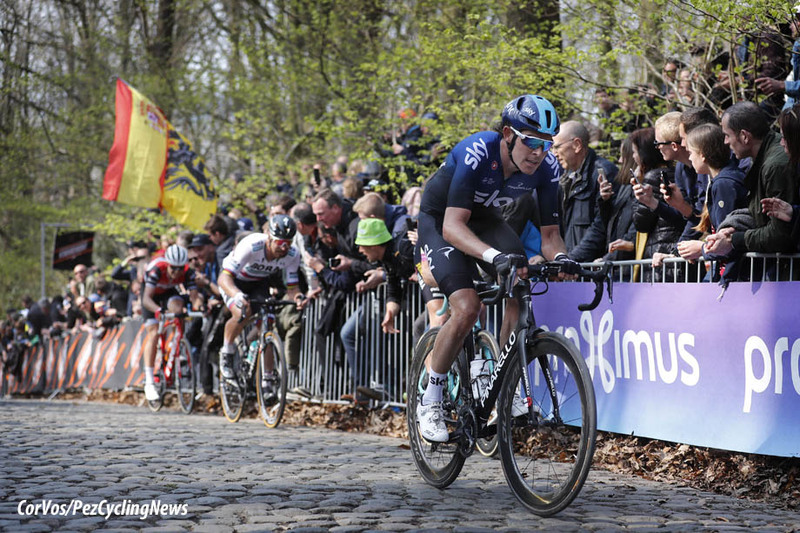 As the leading five hit the foot of the Kemmelberg their gap had extended to 54 seconds. 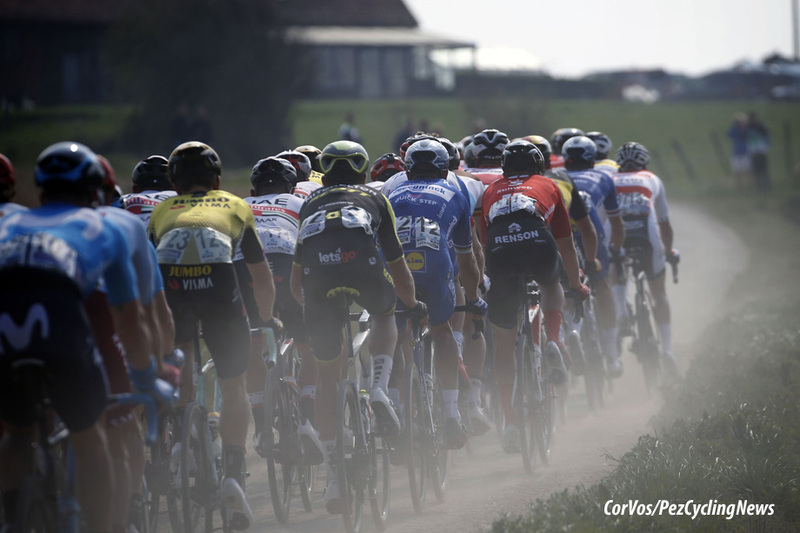 A burst of attacking on the Baneberg had closed the gap but the peloton had since sat up. 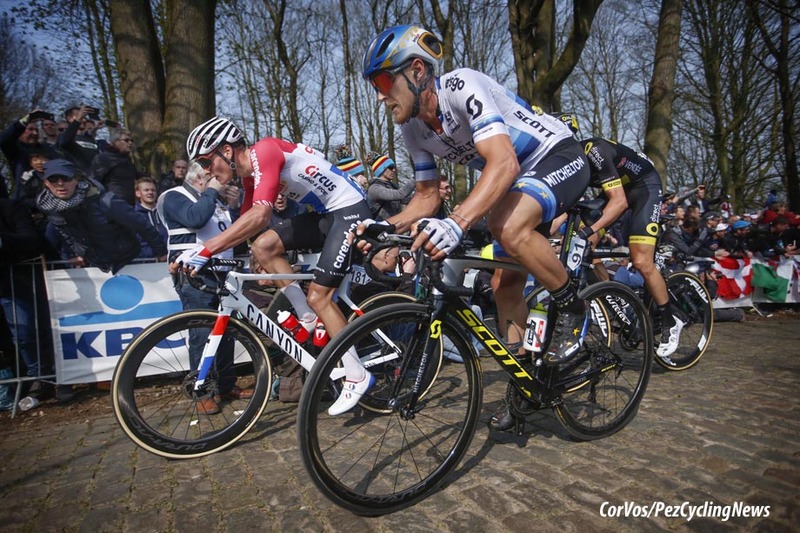 Zdenek Stybar (Deceunick-Quick Step) hit the cobbles first of the peloton and he was followed by Van Aert. Oliver Naesen (AG2R) was leading the rest of the pack as they hit the summit. Stybar and Van Aert linked up with Kristoff and now sat 27 seconds behind the leading five and 20 ahead of the peloton. Stybar was chasing hard despite the fact that Elia Viviani was still in the heavily reduced peloton behind. He would be the favourite if it all came back together. As much as they hurt, the leading five would have hoped for more climbs. On the climbs they were as quick, or quicker, than the chasers but on this very flat run in they were beginning to lose their advantage. It was just 35 seconds with 24km to ride. Stybar had been swallowed up and the Deceunick-Quick Step team were now mobbing the front of the peloton. Viviani was being given an armchair ride and he was now just 23 seconds adrift. 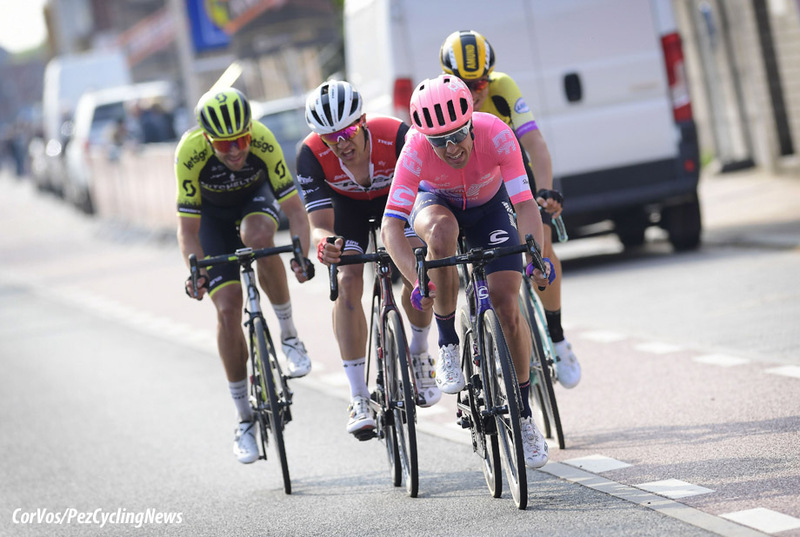 With 20km to go it was virtually game over, the five were in sight and the Deceunick-Quick Step team were barely ten seconds behind. The catch was made at 18km although Luke Rowe took a flyer before he could be consumed by the peloton but he too was caught with 16km to go. Viviani might be the best finisher but he had just two team mates left. They were susceptible to any attacks. With 15km to go Terpstra went alone. For some reason Jumbo-Visma decided to help Viviani out and they neutralised the Terpstra threat. Philippe Gilbert (Deceunick-Quick Step) was the other rider from Viviani's team in support of the Italian and he was trying to stretch the peloton out. By catching the leading five so soon, Deceunick-Quick Step had left themselves open to multiple attacks. Stybar was really struggling, he'd poured a load of energy into his attacks and controlling the racing earlier but he was now being asked to close down every attack. 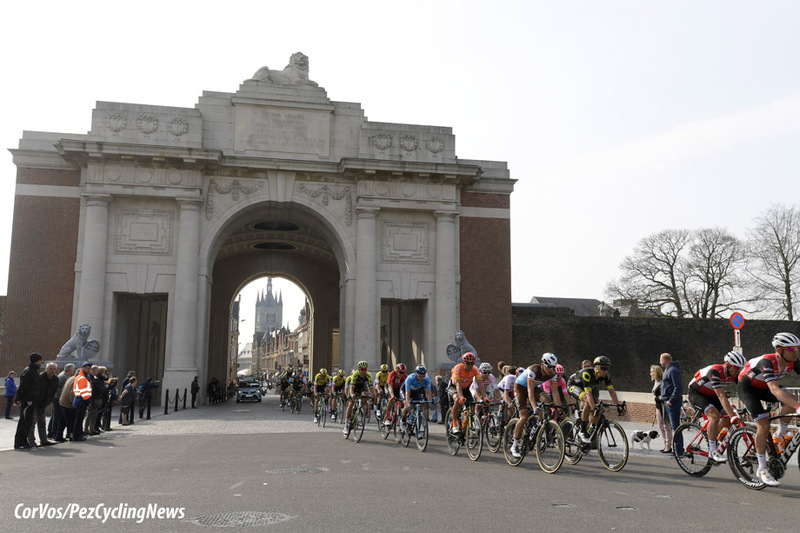 They were now under attack from a lead group of four; Jasper Stuyven (Trek-Segafredo), Jack Bauer (Mitchelton-Scott), Armund Grøndahl Jansen (Jumbo-Visma), and Sebastian Langeveld (EF Education). 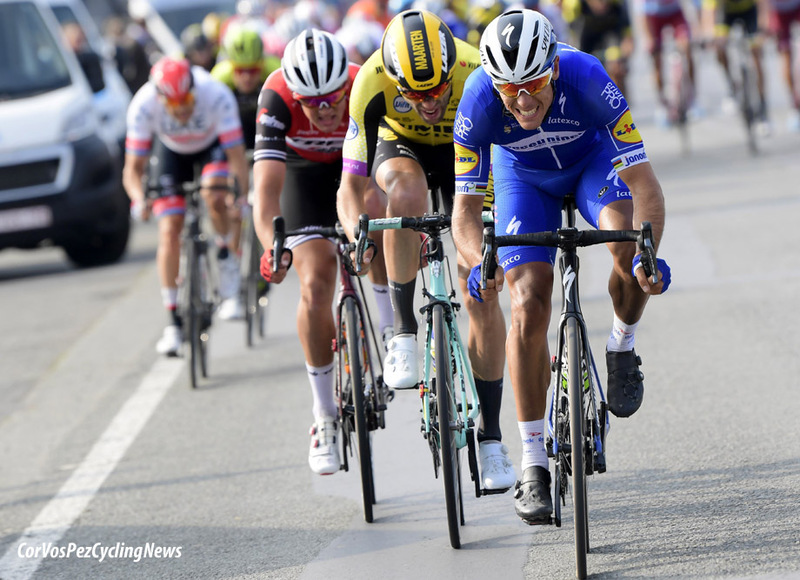 Their gap was small but the chasing peloton were exhausted and Deceunick-Quick Step had burnt their matches. But once more, Stybar and Gilbert appeared at the front with 2km to go. They were emptying the tank for Viviani. 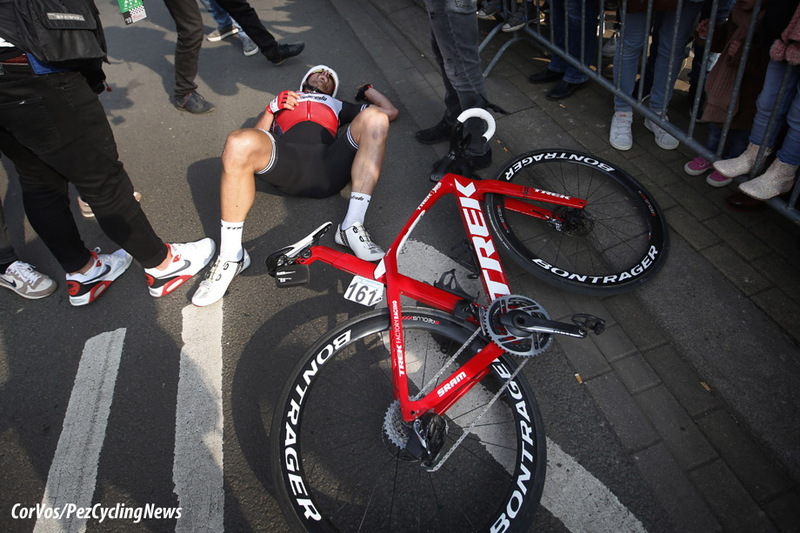 There were no clear sprinters in the leading four but they were inside the final kilometre. Jumbo-Visma were sat in a lead-out but this was a mess, nobody had taken charge. The four were caught in sight of the line but Bauer was still out there. He was caught with 400m to go. It came down to the sprint that Deceunick - Quick-Step had expended so much energy to make happen but it wasn't going to be a win for Viviani. 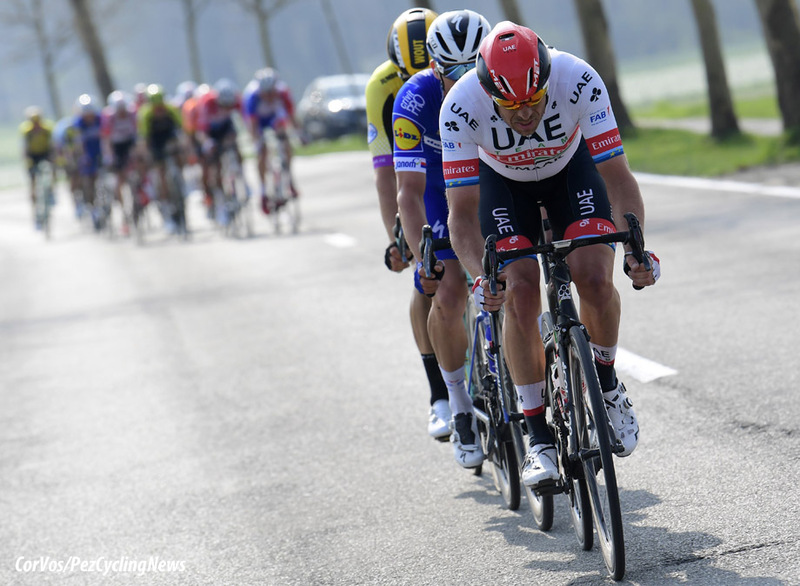 Instead Alexandr Kristoff, who had done so much work earlier in the race, emerged from the scrum to take the win with John Degenkolb in second place. A one-two for two riders who had been in breaks previously in the race whilst other sprinters had enjoyed a much easier ride. Oliver Naesen (AG2R) finished off the podium. 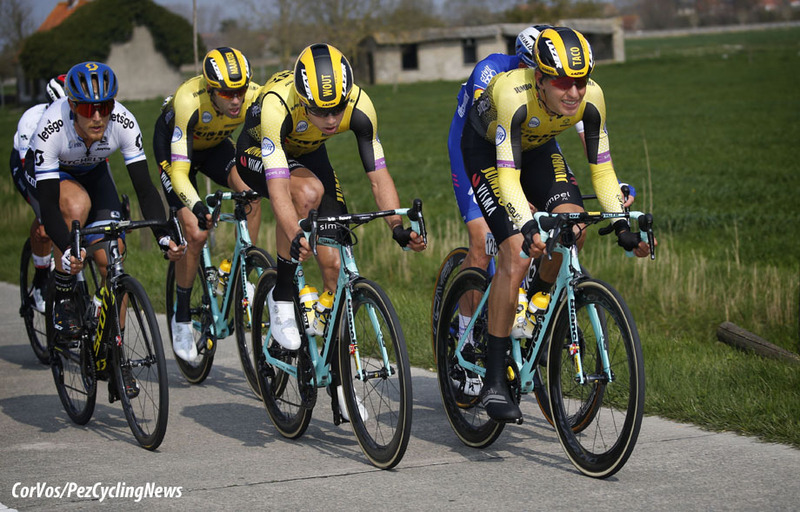 Jumbo-Visma had huge strength in depth but they could only transfer that into a 5th place for Danny Van Poppel. 25. Mike Teunissen (Ned) Jumbo-Visma.